Selling your own book can be a full time job. Nowadays, this seems to be true for authors no matter who your publisher is..unless of course you are already a celebrity with a six figure advance. I have also noticed that it doesn’t leave much time for actual writing. I spend my days researching reviewers and bloggers, updating social media, scheduling radio or bookstore appearances, posting on websites and linking everything together..and fixing the inevitable glitches. Why is it that my video interview occasionally disappears from my website? Why does Amazon run out of books, tell customers it will take 4 weeks to ship, then start filling the orders the same day? Beats me. This afternoon I am composing interview questions for a TV taping next week. It seems that TV interviewers don’t have time to actually read the book so the more help you give them, the more likely they will ask relevant questions. Who knew? The book arrived 6 weeks earlier than expected so everything went on fast forward and a few things slipped through the cracks..i.e. changing the publication date so the distributor could actually list Star Child in its data base and stock some books. Radio interviews got scheduled and bookstores in those areas could not get books.Inexplicably, all of this has made me laugh. I consider most of the last two months one long focus group and crash training course. I am learning a lot and I am in this for the long term, not obsessed with making anyone’s bestseller list. After all there are no vampires in this book and Star Child is not for the Fifty Shades of Gray crowd. But like most things and opportunities in life, the real joy and meaning comes from what I do every day. That boils down to selling one book at a time. It has become my new mantra. For instance, there was the woman in the post office in Chilmark who wanted to know what book I had written after overhearing my postman talk about my daily trips to mail out copies. A conversation ensued. A new and unexpected reader was found. Last week I got an email from a stranger who had met my brother on the coast of North Carolina. She found her way to my website and told me how excited she was to read Star Child. And funny how touched and surprised I am to get those lovely notes from friends who took the time and spent the money to buy Star Child and then tell me what they liked about it. Some even admitted that they did not expect to actually like the book..after all, it was not a cookbook and sounded a little “spiritual” for them. I guess this next phase of Star Child is taking the same steady course it has always taken. Things reveal themselves to me and I am continually surprised. I work hard and then wait. Last week in one day I got three overwhelmingly positive reviews and notes from some of my dearest and oldest friends. “This is the book you were born to write,” said one. “ Your writing has risen to a whole other level...” said another. “I read it one rainy afternoon on my porch...” Sigh. If the Star Child story is about the value of being your true self then my commitment to publishing it has already brought me more than I could have imagined. Friends have volunteered to give book parties. Strangers tell me they keep a copy on their bedside table for inspiration. 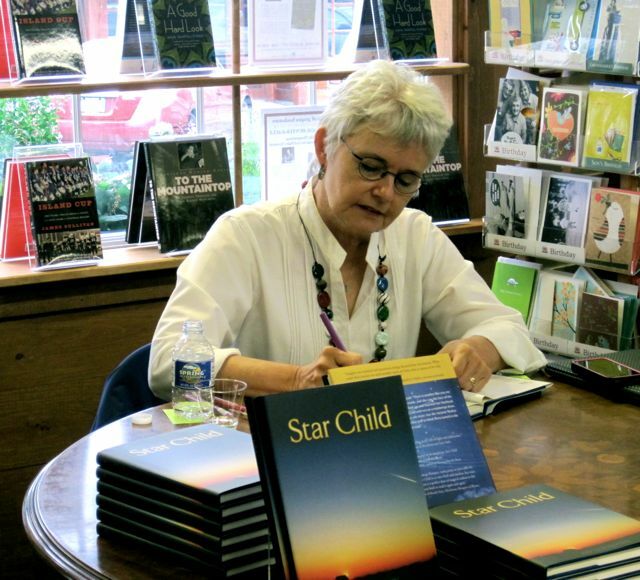 A teacher is reading Star Child to her students. Recently, an angel of a friend ordered 150 copies of my book. 150 copies!!! I was speechless. It seems the more I am surrendering to the idea of selling one book at a time, making the effort every day as a commitment to my own work, the more help I get from every quarter. So who needs Oprah, when I have friends like mine?